Choosing the right centrifuge for Clinical and Cell Culture Labs can be a tedious and overwhelming task for many lab managers. Not only does the centrifuge have to be affordable but it has to be able to provide accurate and precise results while having a diversity of options. It also has to be easy-to-use for all technicians; offer options like refrigeration and heating, able to stay within protocol requirements and/or regulations. If you have just taken over the lab management duties, the task of finding the right centrifuge can be monumental. If you have worked as a lab manager for some time, then you can relate to all of these challenges. Fortunately, Eppendorf, the leader in centrifugation products, recognizes the need for a centrifuge that embodies these qualities. This is why they’ve created the Eppendorf 5702 centrifuge line, the dream come true for clinical and cell culture labs. The Eppendorf Centrifuge 5702 has 3 model options (Eppendorf 5702/5702R/5702RH) to ensure you find the right solution for your lab work. These models cover labs doing; clinical, cell culture, molecular biology, and human medicine work. Additionally, these models ensure that you are able to comply with a regulation of the IVD Directive (In Vitro Diagnostics). Most importantly, all 5702 centrifuge models generate precise centrifugation results to meet strict protocol and give you high-quality performance required in your lab. 5702 has no temperature control but is ideal for routine centrifugation of plasma and serum purification. It contains various fixed-angle and wing-bucket rotors as well as an extensive range of adapters, almost all types of tubes can be utilized. All units include 6 rotors which allow lab technicians to centrifugate common centrifuge tubes, PCR tubes, Cryotubes, screw cap tubes, and 15 mL tubes. All units contain an ECO shut-off which engages after 8 hours of non-use to reduce energy consumption and extend compressor life. 5702R is safe for refrigerated samples, adjustable from -9C to 40C and comes with standby refrigeration, which is perfect for molecular biology applications; specifically safe for holding at 4 C and spinning down centrifugation of bacterial suspension. Built-in condensation drain to eliminate water accumulation and prevent corrosion. 5702RH has precise and active temperature control. It can be adjusted from -9C to 42C, temperature holds steady at 4C and at 37C +/- 1C. It is ideal for human medicine applications including gentle centrifugation of sperm (IVF labs). Immediately ready for use via standby heating/refrigeration. How do the features of Eppendorf Centrifuge 5702 benefit you? 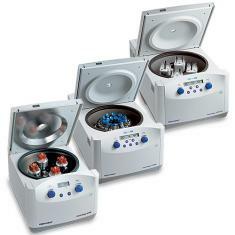 Eppendorf 5702/5702R/5702RH centrifuges are fast, have a dependable temperature range, secure, and are incredibly quiet. Unlike older centrifuge units, the Eppendorf 5702 centrifuges are equipped with large dials and easy-to-read back-lit displays. This allows all lab technicians, no matter their experience, the ability to easily operate the centrifuge. Lab technicians working with speed sensitive samples can easily switch from rpm/rcf so that they don’t have to do any conversions from the protocol to operate it. 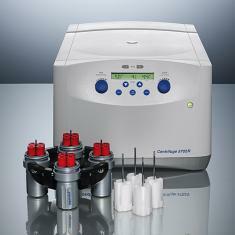 All Eppendorf Centrifuge 5702 models have an easy-to-set up speed which can be set from 100 rpm to a max of 4,400 rpm (1 to 2168 rcf), all speeds can be adjusted in increments of 100 rpm. In addition, run time can be set for up to 99 minutes (1 hour and 39 minutes). These speed features allow a technician to satisfy the requirements of their application without being delayed by slow and unreliable centrifuges. Additionally, the Eppendorf 5702R and RH units allow temperature adjustments in accordance with the researchers needs. Lab technicians dealing with temperature sensitive samples, like human cell lines, will find that temperature control units can optimized their samples. 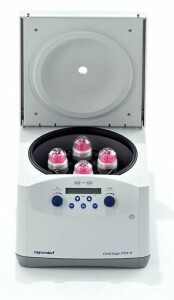 According to Eppendorf’s The influence of the centrifugation temperature on urological carcinoma cell line, “centrifugation at 37C, the core temperature of the human body, may have a positive effect on the viability of the centrifuged cells, reducing cell damage.” Thus, the Eppendorf 5702 R is the perfect solution when working with sensitive samples. 5702 Centrifuges have a lock parameter so you do not have to worry about accidental changes of your pre-set parameters. All temperature control units (Eppendorf 5702R and Eppendorf 5702RH) come with 2 programming keys to store routine procedures and separate FastTemp key. Other unique features of the Eppendorf Centrifuge 5702 include reduced noise. While past models have been loud, the Eppendorf 5702 is much quieter than its predecessors, it has a decimal rating of 45-51 dB(A) (decibels) which is about as quiet as a refrigerator humming, which on average is at 40 decibels, and significantly quieter than a normal conversation which is typically 60 decibels. Eppendorf is synonymous with durability and the Model 5702 family is no exception. The Eppendorf Centrifuge 5702 is constructed with a stainless steel rotor making it rust-free. Thus, even though it comes with a 2 year warranty it’s been known to last 6+ years (or longer with proper maintenance). In conclusion, if you’re running a clinical, molecular biology, or human medicine lab you need an Eppendorf Centrifuge 5702. The Eppendorf Centrifuge family gives you the versatility in speed & temperature, keeps your samples secure, and provides easy to use products. Improve efficiency and productivity in your lab, buy a comprehensive/all-in-one solution that will alleviate all of these problems and keep you within your budget. Save your lab money with an affordable Eppendorf 5702/5702R/5702RH. Call us today at 800-243-3232 for a quote or to schedule a demo.